Flathead Lake isn’t just the largest natural body of freshwater in the West, it’s one of Western Montana’s biggest playgrounds. Located in the glacial-carved Flathead and Mission valleys and surrounded by the Mission, Salish, Swan and Whitefish mountains, it’s a 30-mile-long, nearly 15-mile-wide, 300-foot-deep recreation hot spot. From swimming to fishing to whatever kind of boating you’re into—motor, paddle or sail—the exquisite waters reflecting snowcapped peaks, forested slopes and our wild blue sky are nothing short of stunning, in any season. There are also numerous camping, recreation and fishing access sites along the lake’s 185 miles of shoreline and multiple state park units within Flathead Lake State Park including Big Arm State Park, West Shore State Park, Wayfarers State Park and the lake’s largest island, Wild Horse Island State Park, a day-use state park that is home to wild horses (hence the name), bighorn sheep, coyotes, deer and a variety of birds. 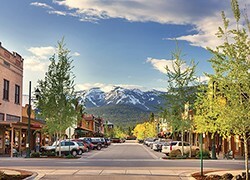 The communities that surround Flathead Lake—Polson, Bigfork, Big Arm, Elmo, Lakeside, Dayton and Somers—all offer something unique, with Bigfork really laying on the charm. Explore the lake and also use it as a base camp for exploring some of the valleys other communities and area highlights. Flathead Lake is a perfect place for families. Plan a stay around one of our events like the Bigfork Whitewater Festival or the Flathead Cherry Festival for some of those cherries you keep hearing about. Also note: the southern half of the lake is located on the Flathead Indian Reservation, home of the Confederated Salish and Kootenai Tribes. When recreating or fishing on these waters, be sure to obtain a tribal permit (available at most area sporting goods stores).